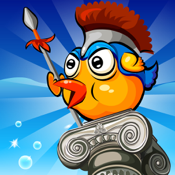 The Odybird is a funny and interesting game adapted from the great saga of the journey back to Ithaca hometown of the hero Odyssey in the Greek mythology. Odybird is on the way to his dear hometown but too many challenges occur Just touch then release your finger off the screen, you can easily control your Odybird and subdue the fish civilian to collect the fishcoin from them. The gameplay is simple but not too easy for you to win against the various enemies in the colorful seas and collect the fishcoin to unlock the new levels. Moreover, you will be challenged with many ferocious bosses in the crusade like the great hero Odyssey, defeat them to explore further! The bright color, lovely illustration together with the simple but interesting gameplay, The Odybird will surely bring you the entertaining experience for this summer. * Surprising and challenging boss system. * Attractive plot based on Greek myths and legends.